AFFORDABLE SCHOOL SECURITY BEYOND THE ENTRY!!! 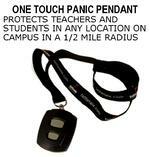 The Tattletale Panic Alarm goes BEYOND the classroom and allows you to protect an entire campus with single system. The base unit resides in the main office and the pendants work over 1/2 mile radius. Working similarly to a silent bank alarm. The solution connects teachers with police in the event of an emergency. Plug it in, protect it all: The tattletale is completely portable and the patented cell burst technology means that you are protected and monitored right out of the box. Wireless and Portable: Sensors can be placed up to a half mile away from the base unit providing perimeter protection that communicate through buildings. Exclusive key fob: With our tattletale key fob, you will be able to arm, disarm, and even set off a panic alarm. No matter where you are with tattletale, you’re never too far from protection.